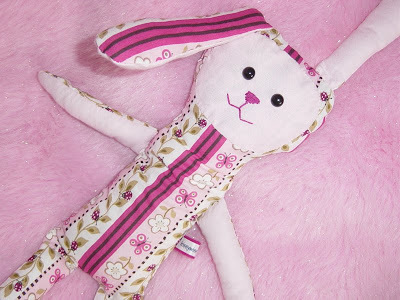 Another pink bunny softie finished today just for Miss 4. She had specifically requested this one in this fabric, and was very pleased with it. It has been named... wait for it... "Pinky". Pinky is snuggled up in bed right now with Miss 4, and as I kissed her goodnight, I also gave Pinky a goodnight kiss, only to hear my realist daughter whisper, "Muuuuuuuummmmmy, it's not real!". What do you say to that... I felt a bit silly? Very very cute.....as good as the original! Your one is all cut out and waiting to be sewn! Hey Kristy, love these softies, they're really cute! !